Friends of a British football fan who has been arrested and detained in the United Arab Emirates for wearing a Qatar shirt to an Asian Cup match have called on the UAE government to allow him to return home safely to the UK. 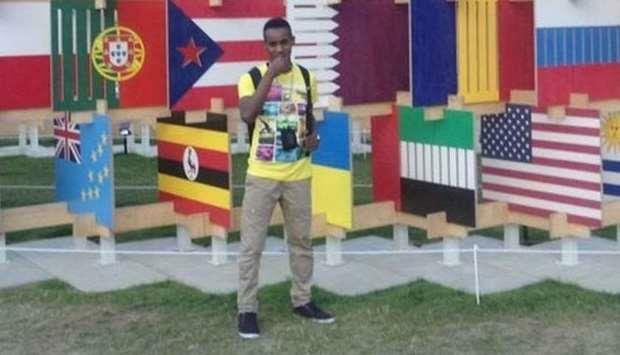 They are appealing to the Foreign Office to advocate for the freedom of Ali Issa Ahmad, 26, an Arsenal supporter from Wolverhampton, through diplomatic channels. Ahmad travelled to the UAE for a holiday in January. While he was there he got a ticket for an Asian Cup match between Qatar and Iraq on January 22. The tournament took place in the UAE between January 5 and February 1 and was won by Qatar . He wore the Qatar shirt to the match unaware that doing anything that could be interpreted as promoting Qatar in the UAE is an offence punishable with a large fine and an extended period of imprisonment. He was later arrested and detained by the UAE authorities. He was allowed to make one phone call and in a distressed state contacted a British friend Amer Lokie. He told Lokie he had been arrested and beaten following the match and accused of promoting Qatar by wearing a football shirt bearing the Qatar logo and that when he went to report the assault he was held over claims that he had made false allegations about security officials. Initially, the UAE embassy told the Guardian it was investigating the circumstances of the arrest. But after other media picked up the story it issued a further statement saying that Ahmad went to the police station in Sharjah last month claiming he had been harassed and beaten up by UAE national football fans for cheering the Qatar team. A UAE official said: "The police took him to hospital where a doctor who examined him, concluded that his injuries were inconsistent with his account of events and appeared to be self-inflicted. On 24 January 2019, Ahmed was charged with wasting police time and making false statements. We are advised that he has since admitted those offences and will now be processed through the UAE courts." The official added: "He was categorically not arrested for wearing a Qatar football shirt. This is instead an instance of a person seeking media attention and wasting police time." Lokie said: "There is no way that Ali would have beaten himself up and then gone to the police station seeking media attention. When I spoke to him on the phone he sounded in a bad state and he was asking us to get him released out of UAE and safely back to the UK. We are trying to raise the profile of his case in the hope that it will lead to his release and safe return to the UK." The sanctions for "promoting" Qatar are linked to the breaking off of diplomatic relations between the two countries in June 2017. An FCO spokesperson said: "We are providing assistance to a British man arrested in the UAE and are in touch with the local authorities." David Haigh, a former managing director of Leeds United FC and founder of campaigning group Detained International, who was himself detained in UAE, called on Foreign Secretary Jeremy Hunt and FCO officials to "act fast and tough". "The Dubai jails are a cesspit of torture, injustice, discrimination and abuse," he said. Radha Stirling of the campaign group Detained in Dubai said: "Because of the limited communication allowed by the UAE to those in custody, the exact details of what happened to Ali Issa Ahmad remain vague … What we know is that the UAE does prosecute anyone who expresses sympathy for Qatar in any way." She added that if Ahmad had been forced to recant the allegations he made to the police and was now being punished for having reported them in the first place, it was "extremely concerning".